Superb table which is the earlier, rarer precursor of the L75. 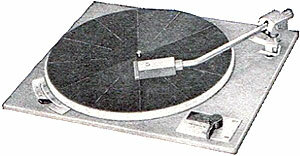 Considered more desirable because of its rarity, minimalist mid-century looks and superior stock tonearm this is the Garrard 301 of the vintage Lenco range (though the 301 and 401 have the superior die-cast aluminium chasis as against Lencoâ€™s cheaper pressed steel top-plate, some prefer the Lencoâ€™s verticle idler wheel implementation against Garrardâ€™s rim drive, so its horses for courses). These are considered classics so there is resistance to radical surgery on them, but non-intrusive mods will turn them into true giant-killers. Plastic idler wheels should be replaced with metal Lenco or after-market ones; replace the older steel bearings with ceramic or ruby balls, a stock plinth with a heavy wood, wood and ply or slate one. These mods and other mods discussed at lencoheaven allow the rich bass and overall massive idler sound stage to really shine through. The stock tonearm, while the best of Lencoâ€™s efforts (and used in transcription tables by the BBC in the â€˜60s), needs a high compliance cartridge to really sing, though. Mine has a Shure M44-8 â€˜scratchâ€™ cart and stylus which is a well regarded match and sounds great. Properly tricked out these are sublime machines. Grab one if you can!